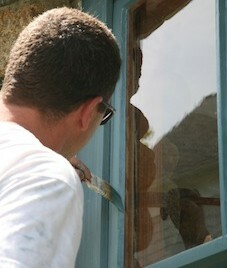 We started by renovating some of the stone bedroom windows. Some of the sashes on the north side of the house appear to date from 1900 and have the original glass with its wonderful ripples and imperfections, others are probably 1923 additions although some are much later. Expert island woodworker Jerry Allen and skilled painter Zeb Tilton have been undertaking the work and Roger has done some of the re-cording (he explains this process on his blog). The idea is to repair rather than replace, only inserting new wood where necessary. We’re using linseed oil paint, which should last far longer than modern paints and will help keep these fine windows working for another hundred years or so. The process is quite time-consuming but far more environmentally friendly than using modern paints. 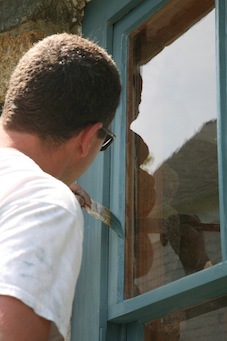 Jerry describes the initial process of priming the windows: “The boiled linseed oil really soaked into the frames, in places as fast as I could put it on, so I put on several coats. It’s on the outside of the frames that it soaked in to so readily, the top sash more than the bottom. By the end of the day it slowed and I left the shop with a glossy coat of wet linseed oil on the wood. I’m sure it will be dry by morning.